CHRISTUS Coushatta welcomes Lavora Wilson, APRN, FNP, to their Coushatta location. From left are Justin McKnight, Director of Operations; Wilson; and Brandon Hillman, Administrator. CHRISTUS Coushatta Health Care Center has seen exponential growth in services over the last few years and has welcomed a number of passionate and skilled practitioners to their medical staff. With a focus on community wellness and ease of access to care for patients in rural areas, the CHRISTUS Coushatta team has been encouraged by the desire and dedication of the practitioners in all five of their locations. The latest addition to their staff is no exception. 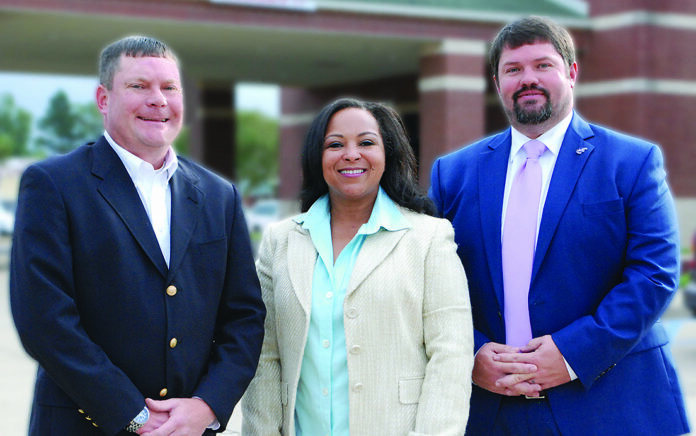 Administrator Brandon Hillman and Director of Operations Justin McKnight welcome the return of Nurse Practitioner Lavora Wilson to CHRISTUS Coushatta Rural Health Clinic. “We could not be more excited to have Lavora return home to care for our community, friends and family. Her passion in healthcare and her relatability align nicely with our mission to extend the healing ministry of Jesus Christ,” McKnight said. Wilson is a Family Nurse Practitioner with over 22 years of nursing experience ranging from women’s health, family practice and urgent care. She received her master’s degree from Grambling State University in 2004. She is no stranger to the area, having worked in Coushatta nearly 15 years. Wilson moved to Dallas briefly, but is returning to work at CHRISTUS Coushatta Rural Health Clinic. She and husband Michael have three sons and one daughter. Wilson has a thoughtful and caring approach to practicing medicine and her skills as a practitioner instill trust that appropriate, preventative care is being fostered in our community.